transform pale gold chicken skin to deep mahogany in a matter of seconds. Although many restaurant chefs use industrial-strength torches, the chef’s torch, lightweight and just 6 inches long, is perfect for the home cook. The butane canisters are small and inexpensive. Buy two, so you’ll always have one in reserve. One canister is good for about 1½ hours of use. Carefully follow the manufacturer’s instructions before using your chef’s torch. For example, pay attention to the advice about the angle of the barrel. If the angle is too severe, the flame will extinguish itself. The torch is not recommended for caramelizing brown sugar, but works well with turbinado and granulated white sugar. Use the torch to toast marshmallows, to char chiles or bell peppers, and to melt jelly or jam glaze on fruit tarts, cheesecakes, and tortes. Use the torch to heat the bottom of a custard cup or pan to ease the unmolding of panna cotta, a gelatin mold, a cheesecake, or other cold mixtures. 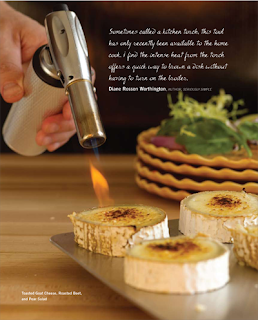 The torch is handy for warming up a knife blade before slicing cold, firm cheesecakes, ice-cream cakes, or pies. Remove sticky fingerprints from the handle with a clean, damp cloth. Always consult the manufacturer’s instructions. The chef’s torch is difficult to replicate, but a preheated broiler will work for some tasks, such as browning the top of a casserole. Commercial chefs prefer the brawny hardware-store torch, but it’s not recommended for the typical home cook.